Our world is full of organisms that scientists have yet to discover and officially describe as a species. You may have heard in the news about a new species of amphibian discovered in a remote rainforest or new species of fish discovered at the bottom of the sea. But you don’t have to travel to far flung places to find new species. Sometimes they are right under our noses…. growing on salami. In a recent paper published in the International Journal of Food Microbiology, a group of scientists from Italy, the Netherlands, Denmark, and Slovenia describe a new species of the fungus Penicillium from an Italian salami. Penicillium species are molds that colonize the surfaces of cheeses, salami, and other naturally aged fermented foods. The fungus that most commonly colonizes salami is Penicillium nalgiovense, a mold that makes the white fluffiness we associated with salami. Spores of mold are applied to the surface of the salami right after the meat has been fermented. The fungus rapidly colonizes the surface and prevents contaminating molds from growing and spoiling the salami. These fuzzy white colonies are the mold Penicillium nalgiovense, the fungus that commonly grows on the surface of salami. The new mold species (Penicillium salamii) is green. When this group of scientists was conducting a biodiversity survey of molds in a salami plant in Calabria, Italy, they noticed something surprising. They found the typical Penicillium nalgiovense, but they also noticed another type of Penicillium species that looked different. While Penicillium nalgiovense is almost always white, some molds were green in color. They isolated these green molds and then sequenced several regions of DNA of these molds to compare them to Penicillium nalgiovense and other Penicillium species. The DNA sequences showed that this fungus is distinct from other existing described species, but identical to undescribed Penicillium strains that scientists had isolated from cured meats in Denmark and Slovenia. The scientists have aptly named this new species Penicillium salamii and suspect that it is quite widespread in cured meats made around the world. Some Penicillium species can produce mycotoxins, toxic substances that can have harmful effects on human health. The scientists checked to see if Penicillium salamii produced these chemicals, but fortunately they couldn’t detect any. So it seems like this mold is safe for cured meat production. 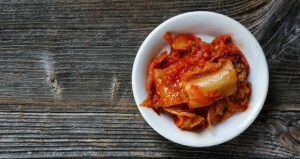 What might be the implications of this research for fermented meat products and microbial foods in general? First, it demonstrates that we still have a lot to learn about these traditional foods that we’ve been making for hundreds of years. New DNA-sequencing technologies and increased efforts have allowed us to better characterize the diversity of the microbes present in these foods. Along the way, we are bound to discover more microbes that are new to science as this study demonstrates. Second, we may be able to use these new microbes in food production. The authors of this study note at the end of their paper that they’ve begun trials with this new species and it seems to be performing nicely. The different color (light green) will create a different salami aesthetic which could be appealing for setting a product apart in a shop. The scientists didn’t characterize the sensory qualities of this mold, but it may produce different flavors than Penicillium nalgiovense. The next time you eat a salami or any microbial food, keep your eyes open. A new species may be right under your nose! Post written by Benjamin Wolfe.